FreeLunch seeks to overcome obstacles to saving money using lessons from behavioral economics. We will partner with employers and financial institutions to offer rewards to users for each retirement dollar saved. These incentives will satisfy users’ natural preference for immediate gratification. In addition, FreeLunch will educate users on personal finance to help them build and reach their retirement goals. We will offer community benchmarking to stimulate users’ competitive urges to perform above average and beat their peers. Half of Americans are “not at all confident” about having enough money to live comfortably during retirement, and 2/3 admit that their 401k savings rate is too low. The annualized personal savings rate, as measured by the Bureau of Economic Analysis, fell sharply in the first decade of the 2000’s to 3.3%, from 5.5% in the 1990s and 8.6% in the 1980’s. As a result, 1/3 of Americans have less than $1,000 in savings, and half have less than $25,000. Why aren’t Americans doing a better job with retirement planning? Behavioral economists suggest that people are challenged in making proper economic decisions when the costs are immediate but the benefits are delayed. Part of this phenomenon results from a lack of willpower—in the heat of the moment, the temptation to purchase a new good seems to outweigh the value of saving and purchasing more goods in the future. Many people rationally decide that saving a certain portion of their incomes is the best choice during their sober moments but later change their mind when staring at that new iPad in the store. While market interest rates are intended to compensate investors for deferring consumption, there is evidence that many people make irrational decisions when it comes to saving for retirement. High-margin and/or growth companies that offer 401(k) programs. Companies that actively compete for talent. Companies that have demonstrated a willingness to experiment with new ideas. Companies with a socially responsible mission. Americans know they should save more but need help doing so. They understand their weakness but receive a constant bombardment of advertisements persuading them to spend. Having a counter-influence to these pressures will help fight the urge to spend against their intentions. We believe that users have been underserved and are not satisfied by current financial websites. Mint.com aggregates financial data and assists users in building goals, but it does not help users increase their urges to save. SaveUp has opted to use a raffle/lottery reward system rather than directly compensating users. Their method is not transparent and seems “gimmicky,” particularly when users consistently leave the site empty-handed. FreeLunch will help its users strengthen their finances by using insights from behavioral economics. The core service will provide users with a reward system for retirement savings – the same idea as credit card rewards, but earned for saving instead of consuming. The team believes that offering this “carrot” up front will help swing decision-making in favor of users’ own self-interests. Each time users contribute to their retirement accounts, they will earn points to be cashed in on gift cards. These rewards will provide immediate gratification, helping users feel more excited about saving for the long term. In addition, FreeLunch will provide rich, user-friendly financial education tools. More than half of Americans have not tried to calculate how much they need to save, and once they do, their estimates of what they will need are often raised. FreeLunch will help users build their retirement goals, track whether they are on pace meet them, and suggest ways to maximize their returns. In addition, FreeLunch will compare results among users to create community benchmarks. Introducing competition will help users understand where their savings rates fall with respect to their peers, thereby motivating them to save more. Freelunch will also provide rewards for meeting goals and winning savings competitions. Freelunch will partner with corporations and government agencies that offer defined contribution plans to their employees. The service will be pitched as a new employee benefit that will help their employees’ financial security, thereby improving productivity and retention. FreeLunch’s cost structure will be significantly lower than the employer could achieve itself due to the economies of scale from working with many companies and retailers. Users will continue to invest directly through their retirement account websites and FreeLunch will import their savings data into FreeLunch accounts. FreeLunch will award 5 points for each dollar saved, incremental to the ordinary benefits gained from investment, such as a company match and earned interest. Once users accumulate 1,000 points (i.e. save $200) dollars, they will earn a $10 gift card from their choice of participating retailers. Meanwhile, FreeLunch will negotiate with retailers to buy gift cards at substantial discounts to face value. Retailers will be eager to work with the Company given that: A) As FreeLunch grows it will drive substantial sales volume; B) Consumers, on average, spend 20% above the value of the gift card at the store; and C) 6-10% of gift card value is never used, representing a windfall of $5 billion to the retail industry in 2009. FreeLunch’s primary source of revenue will be fees earned from the companies it partners with. By While the rewards will have a high impact on users’ retirement savings habits, the cost to the employer is minimal - typically a fraction of a percentage point of total employee compensation. A secondary source of income will be advertising revenues. Banks and asset managers will pay slotting fees to advertise new IRA accounts on FreeLunch.com. FreeLunch will charge a monthly fee and a “per click” fee as users explore additional retirement savings options. New IRA accounts generated through FreeLunch have tremendous lifetime value for financial institutions, as these firms earn fees based on assets under management. Therefore, the advertising rates earned through advertising will be high, between $2.00-$5.00 per click. Finally, FreeLunch will contact state and federal government agencies to lobby for tax and other incentives. As social security nears the point of restructuring and companies continue to shed traditional pensions, the team anticipates that governments will view FreeLunch as an inexpensive experiment in increasing personal savings. Ideally, FreeLunch can negotiate a sustainable source of government funding, but a one-time grant would still provide meaningful assistance while FreeLunch ramps up and negotiates with its other partners. After FreeLunch achieves success with corporate partners and builds a sizeable user base, it will expand to offer rewards directly to individuals through other channels. This rollout will initially be delayed due to cost concerns - it is prohibitively expensive to import individual financial data. However, once FreeLunch establishes relationships with financial institutions and builds a large user base, the team anticipates sufficient negotiating power to address this segment. 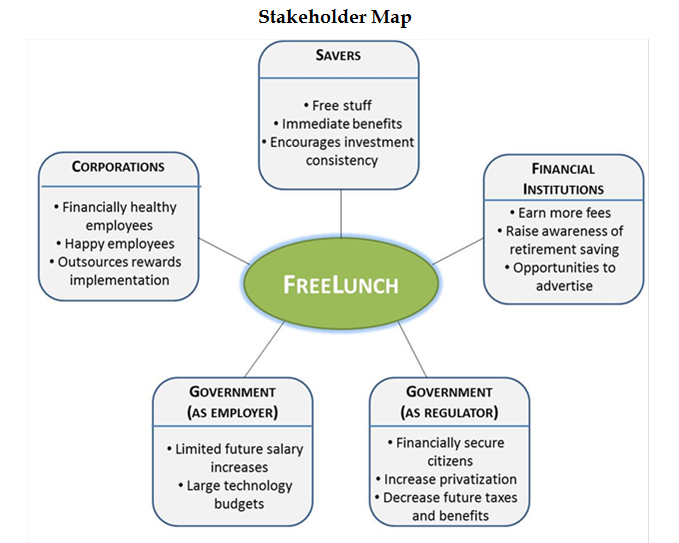 The following diagram demonstrates the value that FreeLunch provides to all its stakeholders - corporations, financial institutions, governments, and of course individual savers. As the company name "FreeLunch" implies, higher retirement savings brings benefits to all parties. FreeLunch's primary expenses will initially be programming. The team's chief development officer estimates this estimate at less than $50,000 for a fully functional website. Additional legal expenses are estimated at $25,000 for the first year. In total, we project the company will need $400,000 to cover the first 3 years of growth before turning cash flow positive in Year 4. Josh Polsky, the founder of the company, has five years of experience in financial services. Josh is a CFA charterholder, bringing a strong interest in personal finance and wide knowledge of financial products to the group. Josh is a Duke MBA student, graduating in May 2012. Demetri Michaelides has five years of experience in corporate finance and is studying strategy at Fuqua. Demetri is also a CFA charterholder and has independently consulted for large corporations in treasury services. Demetri is a Duke MBA student, graduating in May 2012. Darien Covelens has five years of experience as a corporate attorney and is studying finance and financial analysis (accounting) at Fuqua. Darien also brings early-stage investor experience to the group, as he has consulted for venture capital funds and represented start-ups and funds as a corporate attorney. Darien is a Duke MBA student, graduating in May 2012. He has a JD degree from University of California, Hastings and is admitted to the Pennsylvania bar. David Eynon has worked in the tech and IT industry for 10 years and is a successful entrepreneur. David has worked for a variety of top companies and clients in the Finance, Tech, Design, and Content Management industries. He successfully started a custom stationary design company, Papergraphy, increasing its client base by 85% while CEO. Winning $50,000 in the Start-up challenge would be a great first step in capitalizing the company. Our highest immediate expense is to pay a programmer to create the site. Since high customer satisfaction is crucial to FreeLunch’s success, we will also use the money to conduct market research. We will pay survey takers to learn about their preferences and test the website. In addition, the Startup Challenge funds could be used to pay early-stage legal and operating costs. We believe that retirement savings is a huge problem in this country and that FreeLunch can be a valuable part of the solution. Offering rewards will change the equation for users, who no longer will look at saving as solely now-versus-later. We believe that all of our stakeholders have a vested interest in FreeLunch’s success and will become business partners. Thank you for the opportunity to participate in this competition - we look forward to hearing your feedback.